Richard Vinroot is a commercial litigator in the areas of land use and zoning, real estate development and construction, and employment. During the past several years, he has also litigated extensively on behalf of charter schools throughout North Carolina. 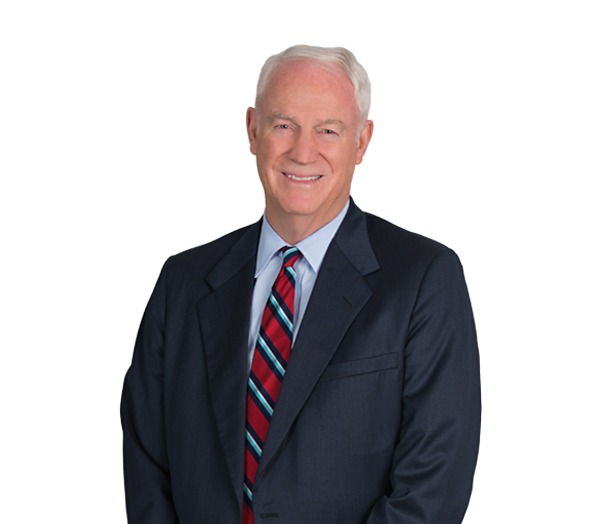 Richard has appeared and served as lead trial counsel in the successful prosecution, defense and resolution of numerous actions in the federal and state courts, and in arbitrations in all of these areas, for the past 50 years. Richard's experience includes successful prosecution of multimillion-dollar claims by public charter schools against governmental agencies for violation of state laws, reversal of a multimillion-dollar assessment by a state agency against an international insurance company, successful appeals before the North Carolina appellate courts, and numerous trials concerning commercial transactions in the state and federal courts. Prosecuted multiple actions against public school systems for their underfunding of public charter schools. Sugar Creek Charter Sch. Inc. v. Charlotte-Mecklenburg Bd. of Educ., 188 N.C. App. 454 (2007); Sugar Creek Charter Sch. Inc. v. Charlotte-Mecklenburg Bd. of Educ., 195 N.C. App. 348 (2009); Thomas Jefferson Classical Academy v. Rutherford County Bd. of Educ., 715 S.E.2d 625 (2011). Prosecuted an action against the North Carolina Department of Insurance in which a multimillion-dollar assessment against a large national insurance company was reversed in North Carolina Superior Court. Defended multiple claims asserted against a large national construction company relating to its multimillion-dollar contract for the construction of Charlotte, North Carolina’s light rail system in U.S. District Court (W.D.N.C.). Prosecuted and defended numerous claims on behalf of national firms performing utility construction work for the city of Charlotte and other local governments. Successfully prosecuted action against the city of Charlotte relating to a multiyear, multimillion-dollar contract for waste collection in which the city's actions were determined to be anti-competitive and unlawful. Cedar Greene, LLC, et al v. City of Charlotte, 739 S.E.2d 553 (N.C. 2013). Prosecuted homeowners' claims against multiple contractors, architects, engineers and other professionals for negligence, breach of contract, breach of warranty and unfair trade practices concerning the defective construction of high-end condominiums with extensive structural defects. Defended breach of contract claims against the developer of a high-end commercial project resulting in the dismissal of such claims by the North Carolina Court of Appeals. New Bar Partnership v. W.D. Martin, et al, 729 S.E.2d 675. Defended claims asserted against the developer of a large residential construction project by a local homeowners association, resulting in the dismissal of those claims by the North Carolina Court of Appeals. Coventry Woods v. City of Charlotte, et al, 202 N.C. App. 247 (2010).